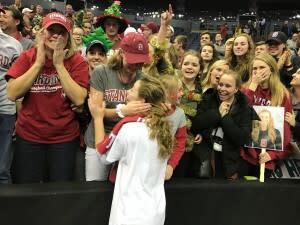 The second-largest crowd – 17,345 people – in the history of the NCAA Division I Volleyball Championship filled Nationwide Arena to watch Stanford and Texas battle for the title on Saturday night. And some of the credit for the big turnout goes to Stanford freshman Morgan Hentz. “We live about two hours from here (in Kentucky) and so many friends and family and my old (high school and club) teammates were here,” said Hentz, one of four freshmen who started for the Cardinal. You didn’t have to be a member of Team Hentz to enjoy the awesome experience that descended upon Columbus for the semifinals and finals of the NCAA Div. I Championship. The quality of play was athletic, powerful and exciting, and so was the atmosphere, despite some issues from Mother Nature: Cold, snow and ice. Walsh Jennings did her part to help take care of the spectators. Four hours before the match began, she was at the Greater Columbus Convention Center, where the American Volleyball Coaches Association (AVCA) was wrapping up its annual convention. Walsh Jennings met with, talked to and posed for photos with a couple hundred star-struck youth volleyball players. She also spent some time with one special young lady, Melanie Wheeler, 13. Melanie has cancer in her spine and brain, and is a Patient Champion at Nationwide Children’s Hospital. Walsh Jennings and Melanie got to play a little volleyball together. “It was fun and she was really nice and I like her a lot,” Melanie said. Walsh Jennings signed a volleyball for Melanie. “I’m going to find a way to hang it up on my wall and I’ll never touch it and every time I look at it I’ll say, I met her,” Melanie said. A few minutes later, Walsh Jennings gave Melanie the shirt she was wearing. The goal was for Walsh Jennings to inspire Melanie, which she certainly did. Melanie was beaming after the meeting, and Walsh Jenning’s shirt was wrapped tightly around her waist. Capell Miller was in the long line to cheer on his friend, Morgan Hentz, and her teammates. The Hilliard resident and his family used to live in Kentucky and remain friends with the Hentz family. In fact, the Hentz family stayed at their home during the tournament. Texas arrived first, and the Longhorns had their game faces on as they walked through the five-deep row of volleyball fans. They had lost to Nebraska in the 2015 final and were determined to win. The Cardinal arrived at 7:13 and seemed more relaxed. They smiled and wave and doled out a few high fives. The doors of Nationwide Arena opened at 7:30 and thousands of people raced over to the Fan Zone, where Walsh Jennings sat and signed hundreds of autographs. Her hand and wrist took a beating, but she smiled throughout. Nearby, members of the AVCA Collegiate All-American Team sat in a row at a long table and also signed autographs. The match started at 9 p.m. and was broadcast on ESPN2. The Cardinal looked a little nervous early in the first set, but soon calmed down and began to take control of the net – and the match – led by their tall and talented hitters/blockers Inky Ajanaku and freshmen Kathryn Plummer and Audriana Fitzmorris. As the match wore on, Stanford’s deeper bench, fantastic freshman and more versatile ways to set and attack made the difference. Hentz was a demon on defense, roaming and diving all over the court to come up with 27 digs, a few of them quite spectacular. After the final point, streamers rained down on the court; the Cardinal players received their medals and the National Championship trophy; the new champions danced and sang; then raced over to the Stanford fans who were gathered at the bottom of Section 105 (including the members of Team Hentz); made snow angels in the streamers; and then signed their names on the court, on the NCAA Championship logo. “We believed in each other and our team chemistry is why we won,” Hentz said.